From my own personal experience, writing a book about the men whose names appear on a local war memorial is fraught with difficulty. 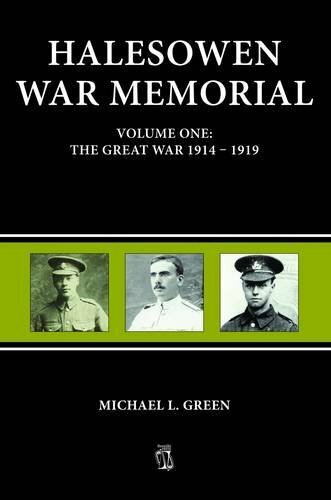 By their very nature these books appeal mainly to people who live in the locality of the memorial or relatives of the men commemorated. Decisions have to be made about how to present the information about the men, for example alphabetically or chronologically. The level of detail can play a key role in the book’s success, but this in turn may be dependent on the sources available to the researcher. With 422 men commemorated on its war memorial, researching the men from Halesowen (south west of Birmingham) was always going to be a huge undertaking. The books adopts the approach of presenting the names in the order they appear on the memorial. The entry for each man provides basic information from the Commonwealth War Graves Commission and Soldiers Died in the Great War databases, as well as details about where the man is commemorated (including the CWGC and SDGW databases – an unnecessary inclusion perhaps). Information about the battle and campaign in which the soldier was killed is also provided. Of course this is not always straightforward, as a man may have died from his wounds some time after a battle. This is where I feel the book lacks some context; further research could have provided much more information, for example from service records and war diaries. Some additional details include the man’s link to the local area and perhaps further information around the circumstances of his death. Where there is uncertainty around the correct identity of a name, alternatives are given. For a small number of men more detail is given, for example from the local newspaper. Appendices include pictures of the local memorials as well as useful breakdowns of casualties by year, theatre of war, and age band. A great deal of time and effort has obviously gone in to compiling the information and as a reference work recording the identities of the men commemorated it serves its purpose well. However I feel the book would have benefited from a narrative to provide more context and help the reader engage with the stories of the men and the effect of the First World War on the town.